If you are asking this question, please refer to an earlier piece I wrote called “Weightlifting Shoes: Why the Hype?” It’s my quick attempt at explaining the purpose and functionality of weightlifting shoes. If you have not read the article, do it NOW before continuing. Alright coach, I’m on board! Which shoes do I buy? This is the fun part! Being a fan of fitness, functional gear and fashion, this topic is one that I always enjoy talking about. By now, you are fully committed and want to take your lifting to the next level. But where do you even begin? Since the sport’s recent rise in popularity and consumer demand, shoe brands are constantly trying to step up their game by proving that they each have value to bring to the table. So whether you want to purchase a basic pair that will get you started or jump right in and purchase the best shoes that money can buy, hopefully you will find some direction after reading this guide. *Keep in mind that this is simply a guide built around my personal experience, research, and the feedback of those that I train, follow and study. Of course, there are many other shoes out there that I won’t cover. I only listed shoes that potentially would be a great fit for you (no pun intended) at several different price points to choose from. I did NOT list any of the crap brands, and of course, I did not mention ALL of the great brands either. Regardless of which shoe you end up with, as long as you are happy, I am happy. Lets start with a great entry level shoe, The Warrior by Wei-Rui. There is a constant battle for both ends of the WL shoe market and when it comes to entry level, I feel that the Warrior surpasses the competition in this arena by delivering a solidly structured shoe with an appropriate 0.75" heel lift. Although Wei-Rui is just a few years old, coming on to the scene in 2011, they have really left their stamp as a brand that brings high quality to the entry level options. Most entry level shoes fall apart due to cheaper materials constructed with poor stitching and glueing procedures leaving you with very little use time. Any review that I’ve come across regarding the Warrior, and other shoes made by Wei-Rui, have always been positive. The Warrior is made up of a real leather upper, has a solid rubber heel with tons of grip, and a single velcro hook and loop system for the metatarsal strap. If you have a foot width of average to slightly wider than average, you will find comfort from the Warrior’s roomier toe box design. The Warrior only comes in black and white and is only offered in men’s sizing that runs a 1/2 size too large. However, if you can get over that bit of nuisance and love the feel of a full leather shoe, this is an awesome choice. You’ll find these shoes at MaxBarbell for only $69. It doesn’t get much cheaper than that! 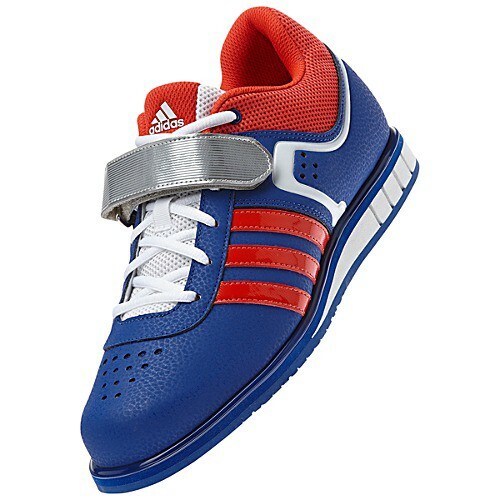 Next in line is Adidas’ entry level shoe, the PowerLift Trainer 2.0. *I will end up referencing three different shoes from Adidas. The names are very similar and two of the models look extremely identical so pay close attention to the details. I will be the first to say that Adidas is a powerhouse when it comes to the development of WL shoes. Their presence is much stronger in the European markets and since weightlifting, much like soccer, has generally been a European dominant sport, it only makes sense of their lineage and expertise in this area. At $90 the PowerLift Trainer is still affordable and yields an athletic shoe type fit that many prefer. A common thread I’ve found among all Adidas WL shoes is their slightly narrow width. If you have a wider than average foot (D-Width), I would definitely try on a pair before purchasing them. The bones of your feet will spread to their greatest width under load and it can be an uncomfortable experience at first. Sure the shoes will break in a bit but that process may take a month of two. The PowerLift Trainer is made up of real leather and a lightweight polymer heel (EVA) replaces the traditional wooden heel. This helps keep production costs low for lifters new to the sport and not wanting to fork over the industry average of $130. The one potential downside of this model is the shoe’s heel height of only 0.6". If you are an athlete who is just at the edge of squatting to depth, then I would suggest finding a shoe make/model with a taller heel lift. A WL shoe’s heel lift can be found as tall as 1.5" but 0.75" seems to be the preferred height. The higher the shoe lift, the less demand for dorsi flexion of the ankle which allows for a more vertical thoracic spine position, and a deeper squat depth. Trust me, your squat will thank you for it. 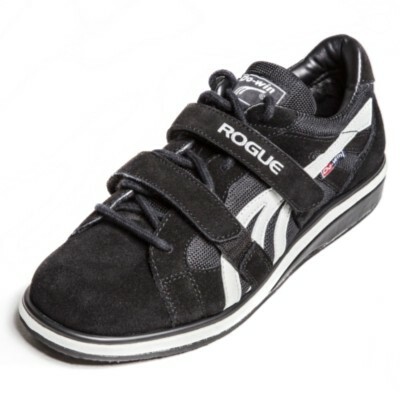 Purchase these at either Rogue Fitness or the main Adidas Website. The Power Perfect 2 is Adidas’ mid-level shoe. I wish they got more creative with the design of the shoe. As you can see, it looks eerily similar to its younger brother but I guess if a design is working, don’t try to fix it. Let’s dive in deeper to see if it is worth the extra money of $150. From what I’ve read and seen, the main difference is in the design of the heel cup and use of different materials. Going with synthetic leather versus full leather may seem like a short cut at first but Adidas’ intention with the Power Perfect is to create a light weight shoe that gives the support of a WL shoe but the comfort of an athletic shoe. 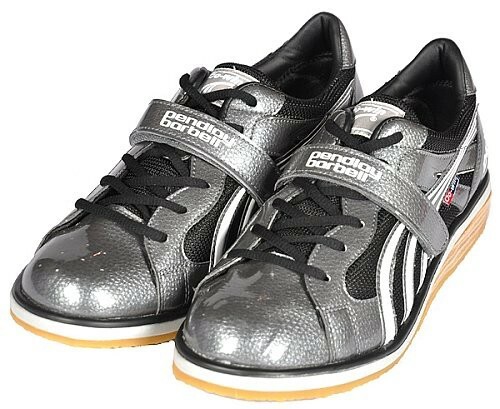 They wanted athletes to wear these during long workout sessions without your feet yelling at you at the end of the day. An increase in breathability was also a goal with more vapor holes in addition to the synthetic materials. The heel cup design is improved over the Powerlift Trainer as well as giving the shoe a taller heel height of 0.75". Finally, Adidas used the EVA polymer for the heel but made it slightly more dense for less ‘give’ under heavy loads and the sole plate is more rigid giving sturdier feedback to the lifter, especially when landing in the split position. One great thing is that the sizing for Adidas WL shoes are the same as their tennis shoes. One bad thing is that these Power Perfects come in only the red/white/black color scheme that you see in the picture. Overall, there is not much to complain about these shoes. In my opinion, Adidas would have sold many more if these were at a slightly lower price point, but I also know very little about distribution, construction, and material costs. Get these direclty from their website, www.Adidas.com. You may find them cheaper elsewhere but they come with free shipping, so make sure you compare. For some, the metatarsal strap may be a little too high on the foot. Next in line is one of my favorite shoes in the group by Do-Win. These were my very first pair and I have since owned two generations of Do-Win WL shoes with much success. They have had some design changes (for the better) and their newest version is in my opinion one of the best bang for your buck shoes out there at only $129. Either way you dice it, they are Do-Wins and I am a big fan. As you can see, Do-Win migrated from the wooden heel to the EVA dense rubber heel while still keeping its 0.75" stance. My only complaint I had with my pairs of Do-Win were the rubber sole plate. In both pairs, they started to peel away at the toe. Perhaps because, on a few occasions, I got lazy and kept them on while doing burpees and double unders. The rubber edge of the sole would always catch on the rubber floor. 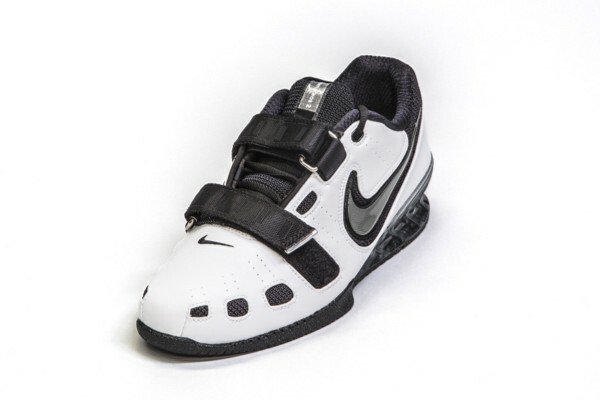 Learn from my laziness, and only wear your WL shoes for weightlifting. I was happy to learn that Do-Win changed up their design for 2013. They have migrated toward a plastic heel while keeping the full leather and heavy duty nylon mesh upper that they are known for. The biggest design improvement is the new rubber sole plate. I love it when a company addresses their flaws and innovates properly. They come in black/white (as pictured) as well as red/white for the men and purple/white for the women. Do-Win shoes tend to run big so when ordering, chose 1/2 size down. (If you wear a 10 in running shoes, then a 9 1/2 in these should fit perfectly) Hit up MuscleDriver to add these to your gear bag. 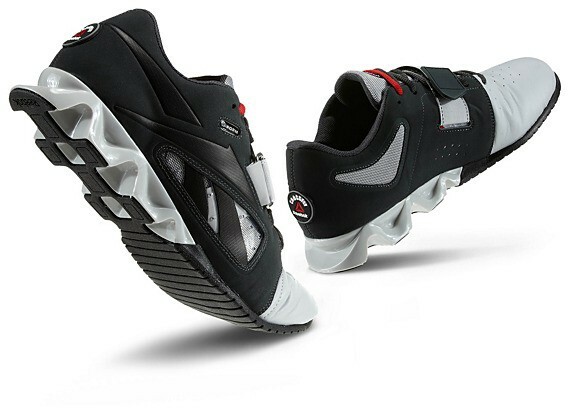 Reebok’s answer was to design a shoe that was a hybrid in functionality. Their approach was to create a shoe that has the heel lift and solid support of a traditional WL shoe while having a flexible forefoot sole design for box jumps, burpees, double unders, and perhaps even pose running. Reebok accomplished that goal all while keeping the shoes light. In fact, its the lightest WL shoe that I have come across. Instead of EVA or solid rubber, the Reebok heels are made up of TPU (thermoplastic polyurethane), a very light weight material that won’t compress under heavy loads. They also offer what they call U-Form technology. In essence, the shoe’s linining is baked in the oven and then cinched tightly around the athlete’s feet to form a perfect fit. This is a common method used by ski and snowboard boot companies. To be honest, I was not accustomed to the flexible feel of the shoe. I favored a more rigid feel and was never able to get adjusted to my Reeboks. Keep in mind that I was wearing a wooden heeled, full leather shoe so it was going from one end of the spectrum to the other. 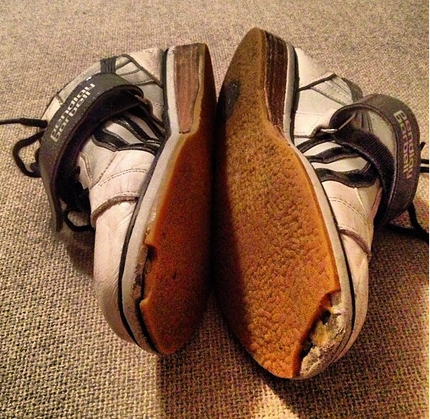 After two months of trial, I always found myself reaching for my scuffed up Do-Wins with the chipped soles. This is not to say that Reebok makes a bad shoe. There are many athletes that love the hybrid approach and the variety of movements that the Reeboks offer. I have never heard of a pair that needed early retirement from falling apart so the design and durability is of very high quality. My one suggestion upon deciding if these are for you is to consider what you want to use them for. 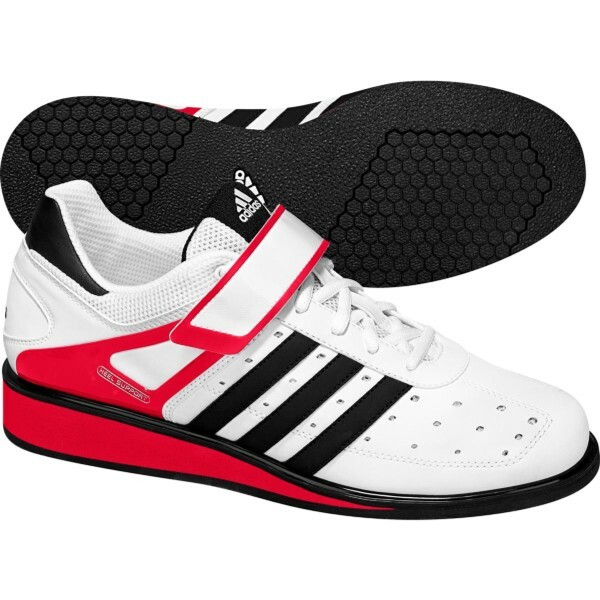 If you are wanting a shoe purely dedicated to the weightlifting movements then my guess is that you will be happier in a different shoe. But if the convenience of a hybrid is higher on your needs list, then this may be the perfect choice for you. Pictured above is this last years model for $129. Read more reviews here. If you are a Nike fan then you are in luck! 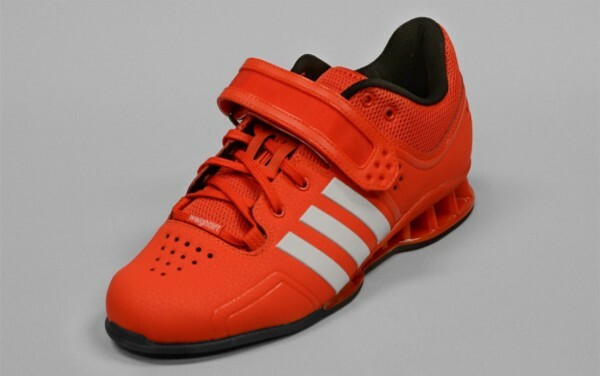 The Romaleos 2.0 are a heavy favorite among lifters especially since they have been revamped since their first showing in the Bejing Olympics in 2008. I consider the Romaleo as one of two top-end shoes available right now. Consider these the Lamborghini of WL shoes. Although Nike is fairly new on the scene in comparison to Adidas when it comes to WL shoes, their design team is always top notch. The original Romaleos were very heavy and stiff. Honestly, too stiff. You felt as though you were lifting in construction boots. The Romaleo 2.0 debut in the London Olympics in 2012 and the changes they have made shows Nike’s intention of being a top player in the market. They kept the sturdiness of the shoe, gave it more breathing qualities and shaved off 50 grams (~2 ounces) in the process. For athletes with wider feet, you will have an easier time squeezing into the Romaleos. Of course the construction is solid offering two metatarsal hook and loop straps. The heel is 0.75" and also made up of TPU. Leave it up to Nike to always consider aesthetics in their design. In my opinion, these are the best looking shoe on the market with several color options as well. Bottom line is you won’t be disappointed with the Romaleo 2.0. Yes they come in at a hefty price point of $190 but once again, these are the Lamborghinis designed to compete with Adidas. Pick them up at Rogue Fitness or Nike. Metatarsal straps are too long for narrow feet. You cant talk about Lamborghini without Ferrari and just how the super cars always battle it out, the Adidas AdiPowers rival the Romaleos in every way. These were not only an answer to the Romaleos but also a replacement for their previous top level shoe that reigned for four years, the AdiStar. Adidas replaced the wooden heel with a lighter TUF plastic and also went away with the kangaroo leather. They are now made from synthetic materials that cures the sweaty feet problem that they once had. To be honest, I was torn about getting the AdiPowers as a replacement shoe for my retired Do-Wins. Simply because I was not a big fan of its one color option: Core Energy. I would have hated myself if I pulled the trigger on getting the AdiPowers and then see that Adidas started to offer new colors a month later. But then I remembered their track record. Adidas rolls out a new WL shoe once every four years, in line with the Summer Olympics, and their top shoe has always come in just one color option. At least this was the case for the past models. “No worries,” I thought. I will just swap out the core energy orangy-red laces for a pair of white laces to help my shoes stand out just a little bit from all of the other AdiPowers around the gym (see main picture above). At first trial, I was not sure about the fit. I have an average D-width foot and shoes that support this should have a toe box measureing 3.9" across for my size 10. These came in at 3.75" making it more of a C-width shoe. But after they broke in, the shoe now feels like it is molded to my feet and fits exactly like they should. I guess Adidas took into consideration the stretching of the material when going to a synthetic upper. I can honestly say that I love these shoes. Of course, they feel rock solid, allow my feet to breath and the single strap is always enough. I especially like the thinner tongue design that is more of a sock liner instead of a tongue. It doesn’t shift right/left like others that I have experienced. At $200 you can find these straight from the Adidas website. They are a big investment and may not be what you need but you will not be disappointed. Best of luck to you on your decision. As a coach, I would be happy to see you in either of these shoes as long as you are able to make gains in your lifts. As I always say, "Look good, feel good. Feel good, Lift good."